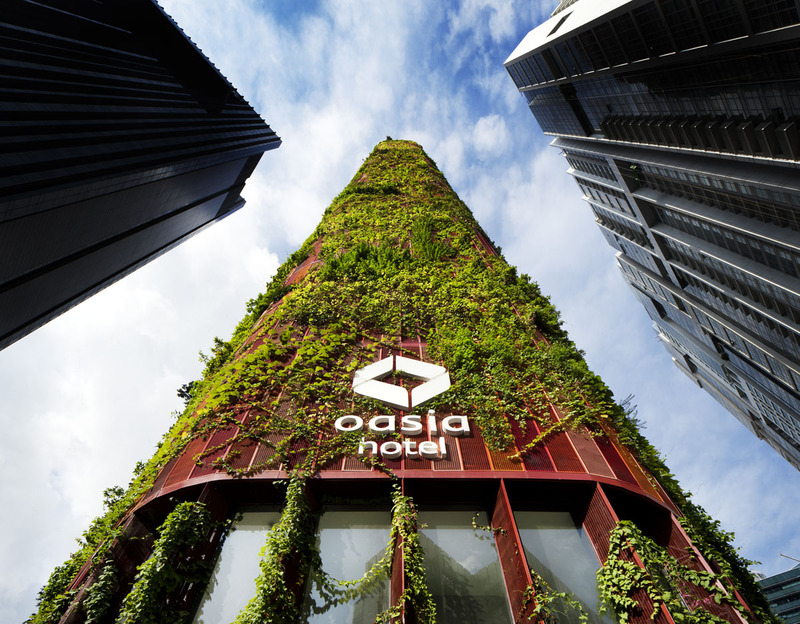 The Oasia Downtown is a mixed-use office and hotel tower designed by Singapore-based architecture firm WOHA, which set out to create “an alternative imagery for commercial high-rise developments.” Clad in a saturating orange and red metal screen living wall system, the building combines innovative ways to intensify land use with a tropical approach that showcases a perforated, permeable, furry, verdant tower of green in the heart of Singapore’s Central Business District. 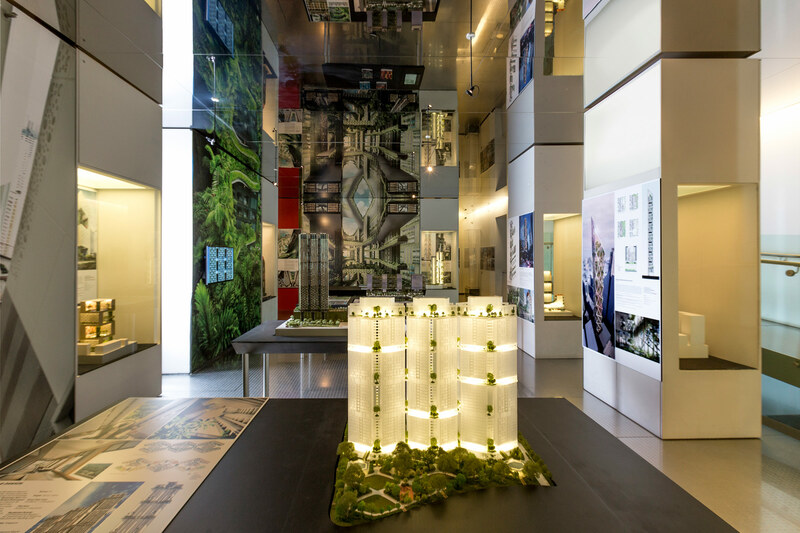 On view until Sept. 4 at the Skyscraper Museum, GARDEN CITY | MEGA CITY showcases the built and unbuilt works of Singapore-based WOHA, an architecture firm that specializes in designing for the world's tropical urban areas. The exhibition begins by contextualizing WOHA's projects with what might be architects' and urbanists' greatest 21st century challenge: the rapidly (and sometimes haphazardly) growing cities of the developing world. 7 of the world's 20 megacities are in tropical areas. So what valuable lessons do WOHA's skyscrapers—designed for density, verticality, heat, and humidity—bring to the table? The exhibition—which consists of ~10 large-scale models shown alongside renderings—argues that it's time to leave the hermetically-sealed modernist tower behind in favor of a more nuanced approach to the building envelope. One built project in particular, a Singaporean public housing project called SkyVille@Dawson (2007-2015), stands out as an exemplar. Its 500-foot-tall towers are diamond-shaped in plan but only one apartment thick at their edges. This leaves a large hollow interior the runs the entire height of each tower; these capacious vertical voids channel cooling breezes and shelter communal green spaces located every 12 floors. Shared spaces, greenery, and passive ventilation are work harmoniously. The Met, a 755-foot-tall tower in Bangkok, makes similarly smart use of natural cooling with a hollow interior open to breezes. Other WOHA projects are verdant, though in a far more luxurious sense. The PARKROYAL on Pickering, for instance, is a hotel and office building in Singapore's Central Business district. Its sculptural concrete forms are brimming with lush vegetation. The other projects fill a similar pattern: large, open, green spaces punctuate the skyscrapers' height. Sometimes massive volumes are removed from the tower to create multiple courtyards in the sky; it's almost as if several medium-height towers with a street-level plaza were stacked atop each other (see the Oasia Downtown, at far bottom). While it's doubtful these latter-day Babylonian gardens are open to the public in most instances, and the proliferation of greenery recalls a broader fad of trees-on-towers, there's no pretension that this architecture is shovel-ready to replace the informal settlements or slums of the world's growing cities. In the words of the exhibition text, "WOHA thinks of their prototypes as components for a fully sustainable future city....Cities must now be made of, by and for people..." and not just "vast agglomerations of inanimate stand-along financial equation." The firm even rated each of its projects in terms of a "Civic Generosity Index," with some projects earning lower marks than others. With luck, projects like Skyville@Dawson will stand as inspiration for when we start designing and planning tropical megalopolises in earnest. It makes perfect sense that Singapore would be the locus for this urban innovation—the tiny island already supplies its own water even as the rest of the world prepares for a coming freshwater crises. With over 80% of Singaporeans living in public housing, the Singaporean government has long been committed to smartly designing for density: necessity is the mother of invention when 5.5 million people need to comfortably live on 277 square miles of land. If anything, after seeing these projects, the Buckminster Fuller in me wanted more (as Bucky would say) "synergy": skyscrapers that not only channel cooling breezes, but also capture rainwater for their residents or even use vegetation and gravity to filter gray water. With greater luck, firms like WOHA will continue to capitalize on the unique circumstances of Singapore to experiment, then transport that knowledge to other cities in the tropics (and perhaps beyond). While this exhibition doesn't show how these towers work in relation to their cities—this is a show for architects, less for urbanists, though design at this scale is practically urban—perhaps WOHA will elaborate on that issue during their next exhibition: Fragments of an Urban Future, which will be at the Palazza Bembo of the 2016 Venice Architecture Biennale. The exhibit will, according to a press release, respond to "the most pressing issues facing megacities today— unprecedented urbanization, accelerating climate change, and the need for preservation of tropical biodiversity." For those interested, you can explore the GARDEN CITY | MEGA CITY exhibition here on the Skyscraper Museum's website. Last week, the Royal Institute of British Architects (RIBA) announced that two U.S. projects have been shortlisted for the RIBA Lubetikin Prize. The distinction honors building projects outside the European Union that set a standard for international excellence. 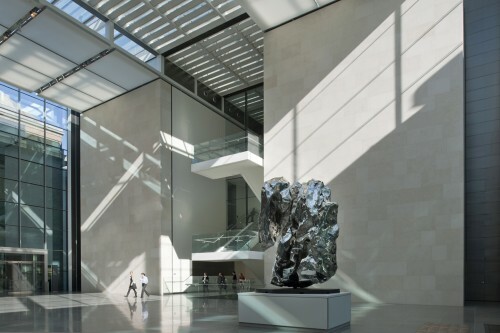 The American projects chosen as finalists are The Museum of Fine Arts in Boston by Foster + Partners and the Virginia Museum of Fine Arts in Richmond, Virginia by Rick Mather Architects. "This year’s shortlist is unusual in that they are all big budget projects—each with a contract value over $100 million," RIBA president Ruth Reed said in a statement. 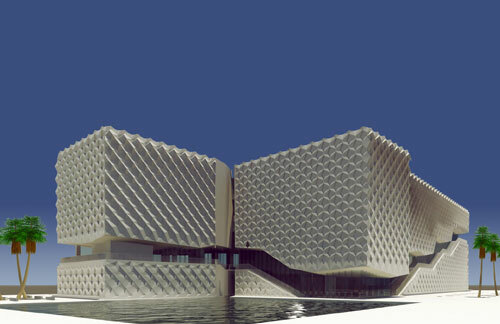 "The list mixes some of world architecture’s most famous names, with a younger practice so it will be interesting to see who the judges choose as a winner." The prize will be announced on October 1 followed by a feature on the winners on BBC 2's The Culture Show. Other finalist projects from around the world: Zaha Hadid's Guangzhou Opera House (Guangzhou, China), Foster's Masdar Institute (Masdar City, Abu Dhabi) and the Met by WOHA (Bangkok, Thailand).